The J.J. Reneaux Emerging Artist Fund supports two different awards programs, both of which provide funds for activities to advance storytelling skills. The Emerging Artist Award provides $1,500 to a storyteller of major and unique performing talent who has not yet received wide public recognition. The Mentorship Award provides $1250 for a gifted younger teller (18-30 years of age) to work with a seasoned teller as mentor. The Emerging Artist Award and the Mentorship Award are given in alternate years. The Emerging Artist Award for 2018 will have applications due in 2017, while the Mentorship Award for 2019 will have applications due in 2018, and so forth. In the winter of 2000 the storytelling community lost one of its most original and daring artists to cancer. 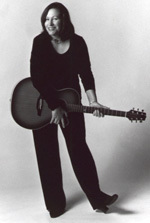 J.J. Reneaux was a storyteller, children’s book author, singer and songwriter. J.J. grew up poor in the Delta bayous, and was rich in the lore of her Cajun people. She succeeded by virtue of a native talent fired by passion and uncompromising dedication to her heritage and storytelling. Her unique voice, fierce and honest as it was beautiful, will long be remembered. As a young unknown, however, J.J. learned how difficult it is to launch a career in the world of professional storytelling. Never forgetting her own struggle, she dreamed of helping talented people succeed. When she saw the end of her life drawing near, she gave her family instructions to create a fund that would support exceptionally gifted tellers in the early stages of their careers. It is therefore with great pride that her family and her beloved colleagues of the National Storytelling Network have established the J.J. Reneaux Emerging Artists Fund. It is J.J.’s dream come to fruition.